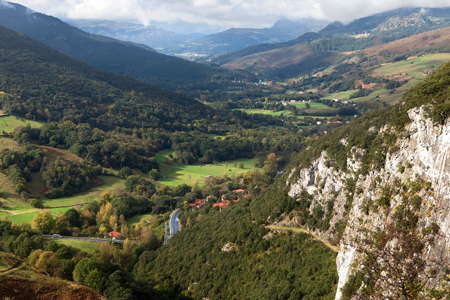 The archaeological cave site of El Mirón is located in the Rio Asón valley of eastern Cantabria, Spain. The cave opening is about 260 metres above sea level, and the cave opening is about 13 metres high, 8-16 metres wide, and 120 metres deep. El Mirón is remarkable for its long occupation history and thus for its long unbroken sequence of history and prehistory of Cantabria, Spain. The site includes human occupations between the Middle Paleolithic (ca 41 000 years ago) to AD 1400, including Mousterian, Early Upper Paleolithic, Solutrean, Magdalenian, Azilian, Mesolithic, Neolithic, Chalcolithic, and Bronze Age deposits. Map of the Rio Ason drainage basin. La Haza and the Ramales open-air site are immediately NW of El Miron and La Luz is SE of it. Notable also is the presence of at least one needle fragment at about 19 000 BP. Measuring 2 mm in thickness, this piece, like the very small Antalis (Dentalium) 'tubes', reminds us of the likely importance of fine sewing and stringing that was already going on in the Solutrean, which is when the needle seems to have been invented or adopted in Western Europe. Photo: M. González Morales, drawing by P. Burgeño. 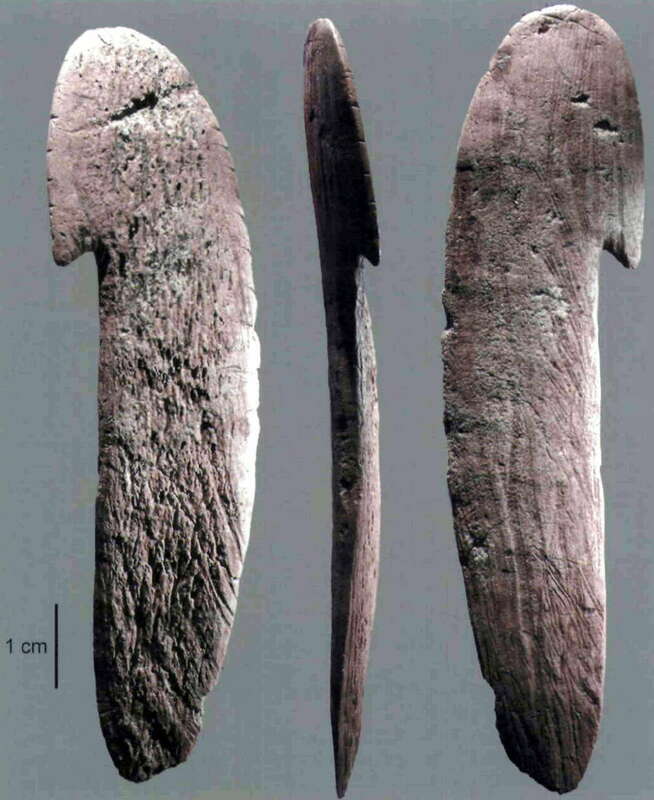 Another exceptional discovery from Mirón Level 17 is a spatulate antler object with a hook and engraved lines. It was found in June 2007 at the base of the level (spit 65) in subsquare I3a, in an area dense in fire-cracked cobbles and loose, blackish sediments that appeared to define a hearth. Near it in the same subsquare were a sagaie and a bone needle. The base of the hearth (spit 66) was in direct contact with the top of Level 18. a culturally far less rich and less organic, lighter-coloured stratum, that is also marked by the presence of larger limestone blocks. 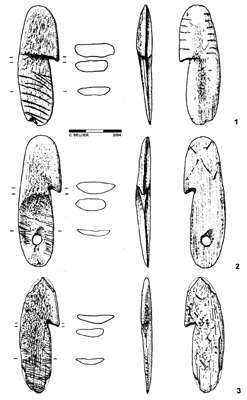 The object in question is 89.2mm long x 18.4mm wide below the hook (and 21.65mm above it) x 5.4mm thick (max. ); the angular hook protrudes 3.8mm. Without the hook, this spatulate object would have an elongated oval shape. The cortical (split antler?) surface has apparent scrape marks perpendicular to the axis of the narrow (below the hook) part on the surface away from the edge that is hooked. In the same narrow part of the objects cortical surface, but on the side nearest to the hook, there is a series of fine, parallel engraved lines that are oblique to the axis of the piece. In the wide, hooked part of the object, the cortical surface has two patches of fine parallel engraved lines that are parallel to the axis of the piece. On the spongy bone surface of the narrow (non-hooked) part of the piece there is a series of fine engraved lines occupying the half of the surface that is away from the hook. 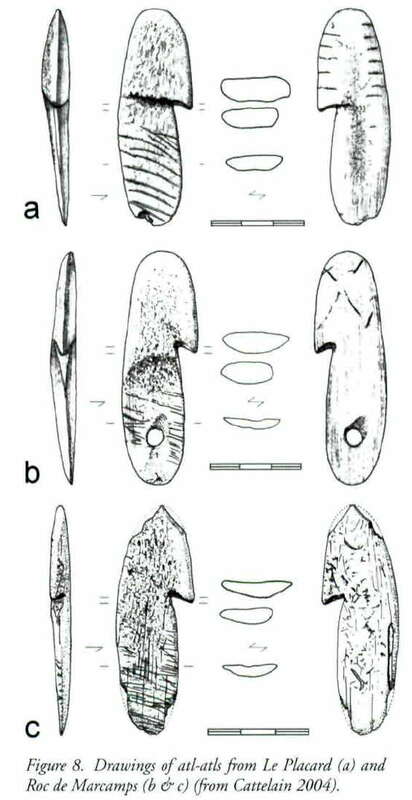 Finally, there are a series of short engraved lines along the bevelled edges of the wide part of the item: one on the edge just above the hook on the cortical face; the other on the edge of the spongy bone surface opposite the hook. The whole piece is highly polished. 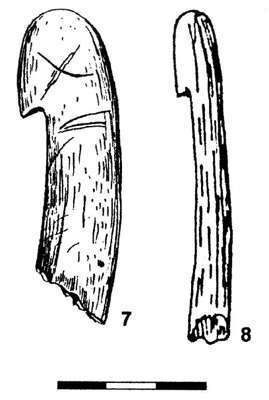 The only other artefact published as a possible spearthrower (atl-atl) from the Cantabrian region is an item found by Obermaier in his early Magdalenian ('Beta') stratum in El Castillo. It is about 60mm long. 7.5mm thick and the shaft is about 10mm wide. The (curved, rather than angular) hook protrudes about 7.5mm. It is undecorated and is not oval-shaped like the Mirón object. The proximal end of the shaft is bevelled along one face, possibly to facilitate hafting onto a longer (wooden?) handle. 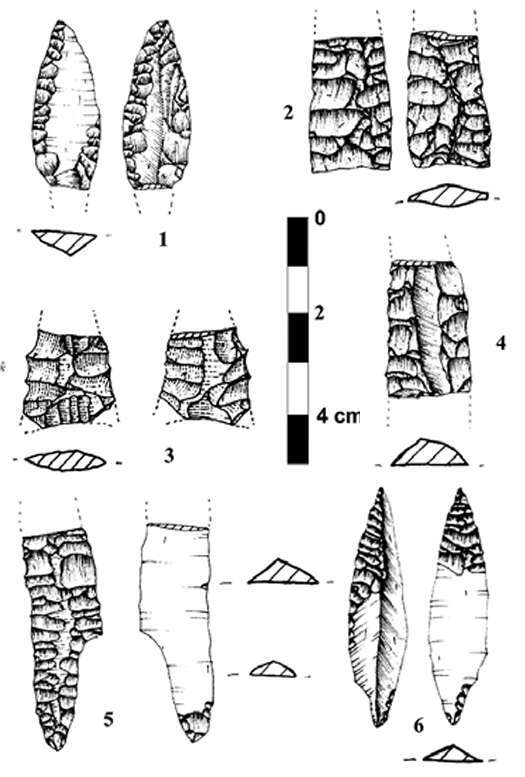 Although Cattelain classifies this piece within his Type 2 of atlatls, there are actually three other pieces that are much more similar to the Mirón piece than the Castillo one. 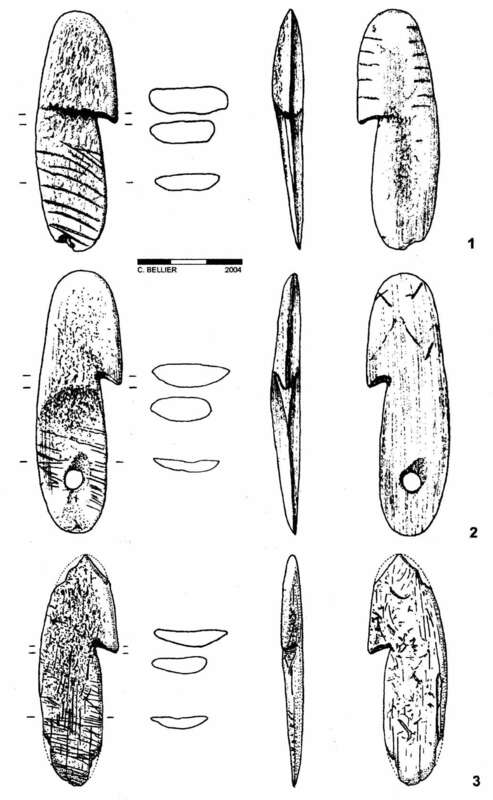 Two are from Levels 3 and 3b of Roc-de-Marcamps (Gironde, near Bordeaux, France), which - interestingly - date respectively to 15 070 ±270 and 15 700 ± 4 5 0 BP Both are oval, with short, angular hooks and oblique engraved lines on one surface each of their narrow parts. One has a hole near the proximal end. Lengths of the two Roc-de-Marcamps items are similar to Lengths of the two Roc-de-Marcamps items are similar to that of the Mirón piece (100 and 90mm) and, again, both are maximally about 25mni wide at the hook (and about 20mm wide at the shaft). Thicknesses are about 7-8mm. 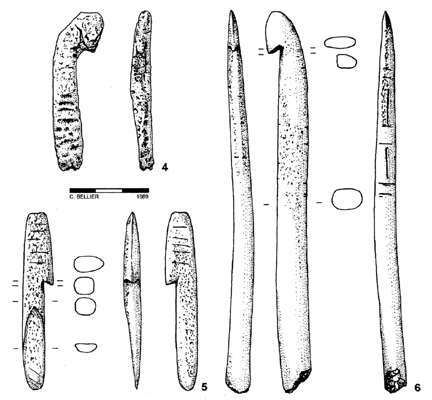 The third French object that is very similar to the El Mirón atlatl is from nineteenth-century diggings in the famous site of Le Placard in Charente, France (Cattelain 2004). This piece is 69mm long x 9mm in maximum width X 23mm in maximum thickness. 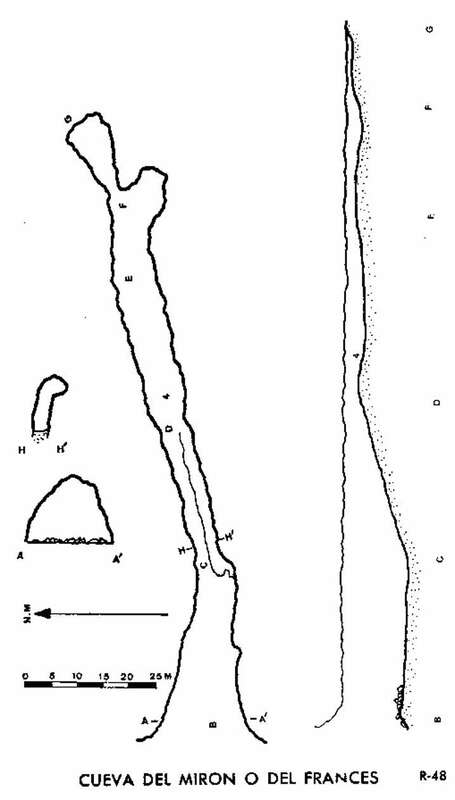 The shaft is about 20 mm wide and the hook protrudes about 6mm (which is also the corresponding measurement for the two Roc de Marcamps atl-atls, as best as can be measured from the drawings in Cattelain's publications). The Le Placard piece apparently came from an early Magdalenian deposit, but is undated. Roc-de-Marcamps and Le Placard are respectively about 350 and 450km north-north-east of El Mirón, as the crow flies. General photograph of the engraved scapula from El Mirón (M. González Morales). Several fragments of scapulae with engraved lines have been found in the Lower Magdalenian horizon of El Mirón, but the principal piece is an essentially complete shoulder blade of a very large red deer stag from the middle of Level 17 (spits 52-54 of subsquare H2b) (Figures 2-4). It was found in June 2004 in the midst of all manner of Magdalenian 'refuse'. The scapula (specimen number H2-1981) measures 300mm long x 71mm wide x 88mm across the transversal crest. 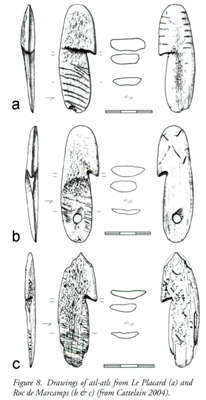 Although fragmented, the articular end and most of the blade are preserved. We believe that rapid burial contributed to its excellent condition, despite its intimate association with fire-cracked rocks and other clasts. The flat surface of the shoulder blade bears the engraved image of the head, neck and part of the dorsal line of a red deer hind, including such details as a nostril, an eye and the base of an ear (the rest of the ear, the top of the head and the bottom of the neck are missing, despite painstaking examination of all flat bone fragments found in the screen residues from the relevant spits in this area of the excavation). The lower part of the muzzle and the area around the eye, as well as the front of the neck are 'shaded' with numerous sub-parallel striations, probably to give the impression of relief and to suggest musculature. The head and dorsal outlines are done with multiple engraved traces. Immediately behind the deer is a simple, incomplete image of a possible bovine (aurochs? ), the tip of whose muzzle overlaps with the back of the hind's head. 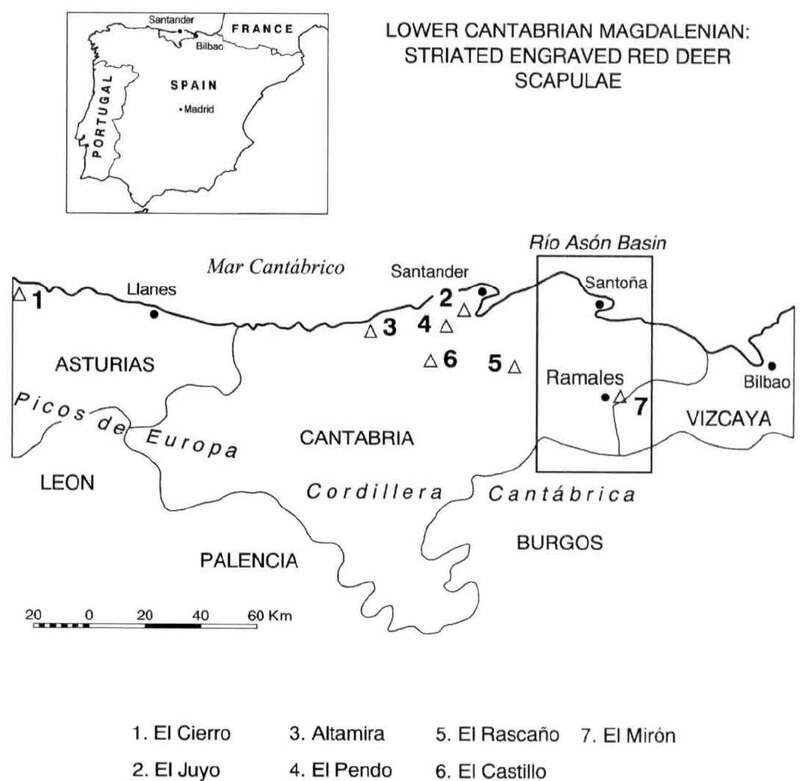 Drawing of the red deer (and bovine) engraving on the scapula (M. González Morales). There is no internal 'shading' in this second outline figure, which represents the head, neck, dorsal line and forequarter of the bovine. The mouth and nostril are summarily depicted by a series of curved striations; these are the only anatomical details represented. 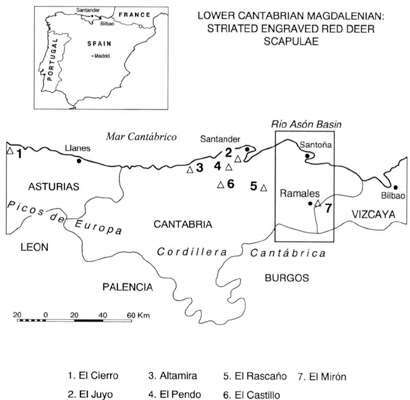 Engraved shoulder blades generally depicting red deer hinds (sometimes coupled with other ungulates) have been found in several Cantabrian sites for a century, the first discoveries having been made by Alcalde del Rio in Altamira between 1903-6, followed by those of Obermaier in El Castillo in 1911 and again at Altamira in 1924-25 (Almagro 1976). 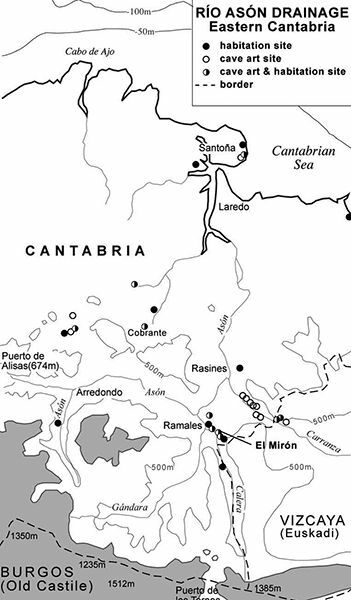 Subsequent discoveries of very similar objects were made in El Juyo, El Pendo and El Rascaño (all in central Cantabria province, like Altamira and El Castillo), plus El Cierro (in eastern Asturias). (drawn by L. Straus, redrafted by R. Stauber). 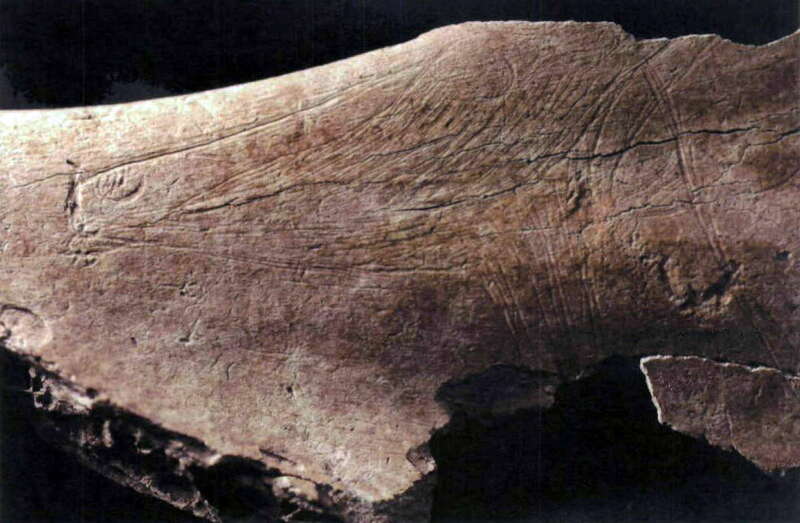 Controversy had surrounded the dating of the striation engraved scapulae since the start, with Alcalde del Rio claiming that his were from the top of the Altamira Solutrean stratum, while Obermaier asserted Early Magdalenian provenence for his finds from both El Castillo and Altamira. In the light of this uneven record of provenance and chronology, the engraved scapula from El Mirón Level 17 sheds considerable light on the question of the age of this very distinctive artefact type. 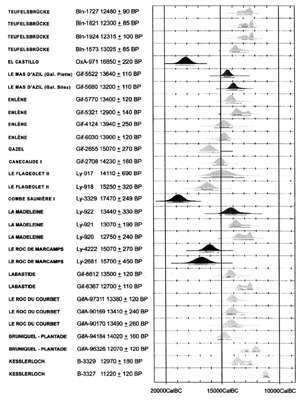 There are four 14C dates from Level 17 - In descending stratigraphic order they are: 15 470±240, 15 450± 160, 15 700± 190 and 15 370±80 BP (the first two are conventional dates on bone collagen, the third was done on charcoal by extended count and the last of these is an AMS date on charcoal). These dates are coherent with slightly younger dates from overlying Levels 15 and 16 (as well as with one of two dates from vestibule rear Level 116, which also yielded a fragment of engraved scapula) and with a date of 16 080 ± 40 BP for underlying Level 18. The result strongly suggests that the 35 - 40cm thick Level 17 formed rapidly around 15 500 BP (around 16 600 cal BC) and that this represents a likely central age for the striation-engraved scapula style (as less precisely or certainly suggested by the dates from Altamira, Juyo and Rascano), a specific marker of the Cantabrian Lower (not Initial) Magdalenian. The straight-line distance between Mirón at the eastern end and Cierro at the western end of the presently known distribution of the Lower Magdalenian striation-engraved scapulae is 135km. Leaving out the Cierro outlier, the Cantabrian site cluster is no more than 55km in west-east extent, from Altamira to Mirón. Both coastal and montane sites are represented, though the latter are never more than ca. 30km from the present shore. This area perhaps represented the territory of a regional band composed of smaller local bands, each concentrating their habitual subsistence-focused movements on individual valleys, namely those of the Saja/Besaya, Pas/Pisueña, Miera and Asón rivers, but with significant social contacts (e.g. co-operative hunts, intermarriage, exchange, visiting, ritual activities) among them. 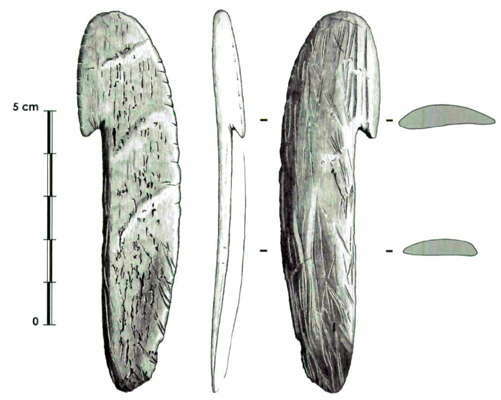 The Cantabrian engraved scapulae are among the best indicators of the existence of regional social territories in the Upper Palaeolithic of Western Europe. This is the mountain where El Mirón is situated. The El Mirón entrance can be seen at the centre of the picture, above a yellowish tree. 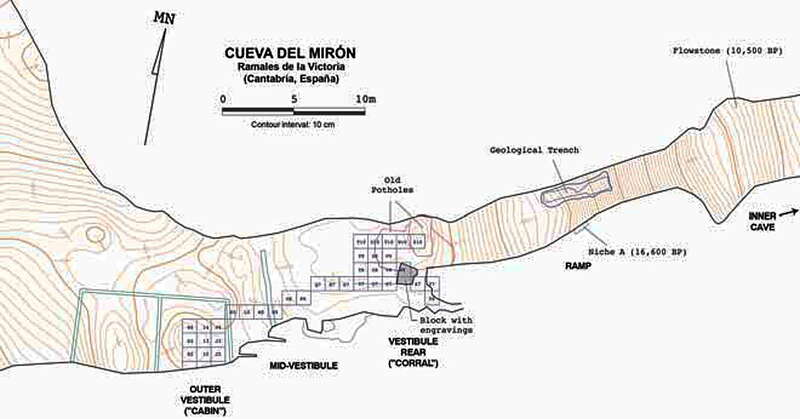 Plan and cross section of El Mirón. Plan of El Mirón Cave vestibule (the exterior is to the west), showing locations of excavation areas and connecting trench (topography by E. Torres, modified by M. González Morales Ó' R. Stauber). Plan of El Mirón Cave vestibule. 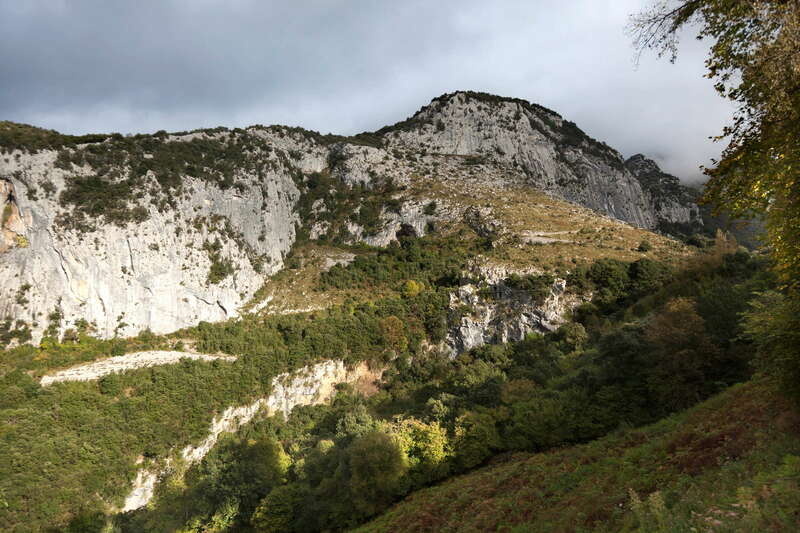 Geologically, El Mirón is a karstic cave, formed along the junction of vertical and horizontal planes of weakness developed within hard Lower Cretaceous limestone. The mouth of El Mirón faces west, above the confluence of local tributaries – the Río Calera and Río Gándara – about 100 m below. The main vestibule of El Mirón cave measures 30 m deep, 8–16 m wide, and 13 m high, and the total accessible cave length is approximately 130 m.
Stone boiling is one of the principal cooking methods used by hunter-gatherer societies. 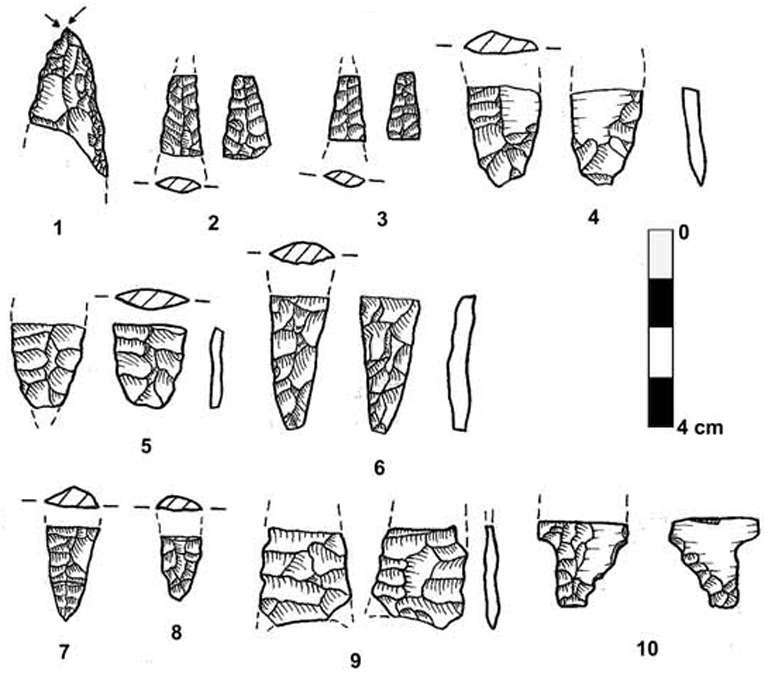 The El Mirón people used this technique extensively, and the analysis of fire-cracked rocks demonstrate that the hearth investigated by Nakawaza et al. (2008) was used and maintained during visits of humans who hunted mainly ibex and red deer near the site. Stone boiling was employed to maximise the energy and nutrition obtained from carcasses of this game, usually to extract the fat from the bones of red deer and ibex, a resource that otherwise may have gone to waste. It is believed that one of the most important uses of stone boiling was to extract the fat from the animals hunted, which was a highly valuable resource for the hunter gatherers who used the cave. The rendered fat so obtained was a method used to increase food supplies and as a hedge against scarcity. The rendered fat could be stored in the cleaned intestines of the animals from which the fat came, and in this case was collected in a shallow basin hearth from the ca 15 000 BP level in El Mirón Cave. 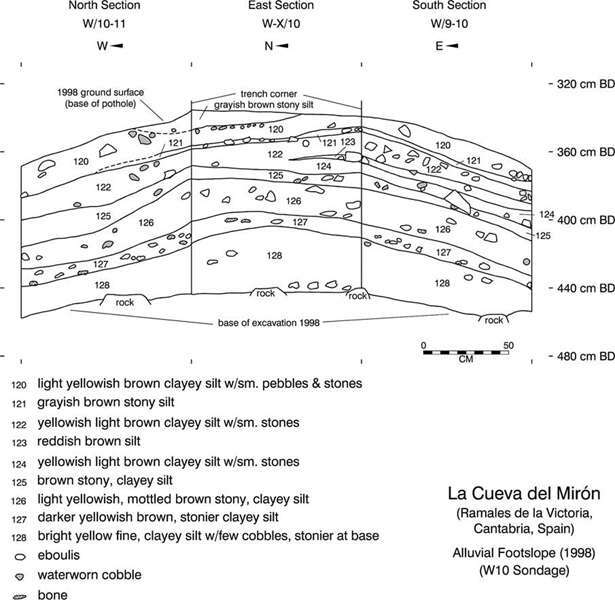 The burnt items at El Mirón are mostly Fire Cracked Rocks (FCR) and the majority of them are hard sandstones that are abundant both in the ancient alluvial sediments that fill the inner cave, and in the bed loads of local rivers. Many of the cobbles in the Magdalenian levels have traits (i.e., color change [red and/or black], surface cracks, and irregularly fractured sections) that are compatible with results of fire experiments. More than 3500 pieces of Fire Cracked Rocks were recovered from the Early Magdalenian levels of El Mirón Cave. It has been demonstrated that heated cobbles were only fragmented when they were rapidly cooled off by dropping them into water. Within the long sequence of deposits investigated, deposits of the Early Magdalenian (17 000–13 000 B.P.) are characterised by dense accumulations of bones, stone and bone artefacts, ochre, and Fire Cracked Rocks separated by no sterile layers. Among the faunal remains, ibex and red deer are dominant, whereas fish bones visually and genetically identified as Atlantic salmon are frequently recovered, while marine mollusks appear more rarely (often in the form of perforated beads). 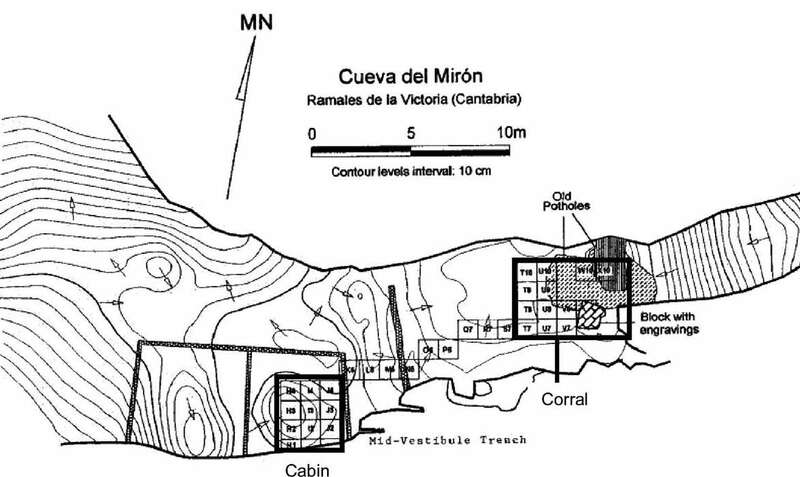 A shallow basin hearth located in square H3 (see the plans above - Don ) filled with cobbles was investigated, the largest and most complex hearth found in the vestibule front ('Cabin') area of El Mirón Cave. It is contained in 4 excavation layers and was dissected over the course of two 2-month field seasons. A charcoal sample from the base of this hearth was dated to 15 370&plusmin;80 B.P. (GX-32654), while dates from surrounding Level 17 range between 15 450 and 15 700 B.P. Because of its elaboration and large scale, we expect that this hearth was designed to serve specific classes of subsistence activities, and was used for more than a single episode of activity. Drawn by S.Ruiz and N.Suarez. 10. V8c, Lev.119, spit 28, No.4674. 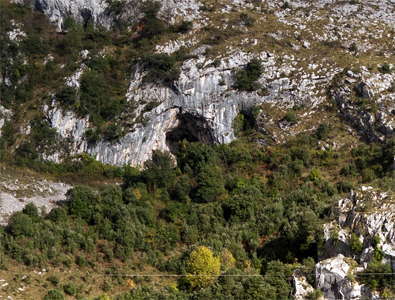 One of the big finds uncovered during the excavations at El Mirón cave (Ramales, Cantabria, Spain) this summer was the partial skeleton of a human that dates back to somewhere between 8 000 to 15 000 years ago (radio-carbon dates still pending). This past Wednesday Dr. González Morales held a press conference to announce the finding. The remains are thought to be possibly female. 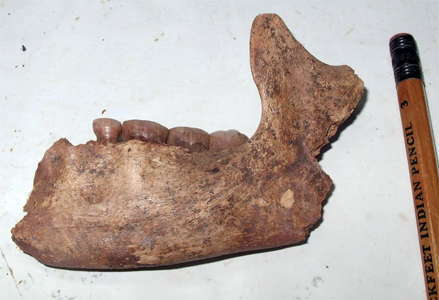 The time frame of the deceased places the individual in the time period of the Magdalenian tool type. The remains and the surrounding area were covered with red ochre, which has lead Dr. González and Dr. Lawrence Straus to believe this area may have been the site of a ritualistic burial. This would be the first such burial of it's kind from the Iberian penisula during this time period. 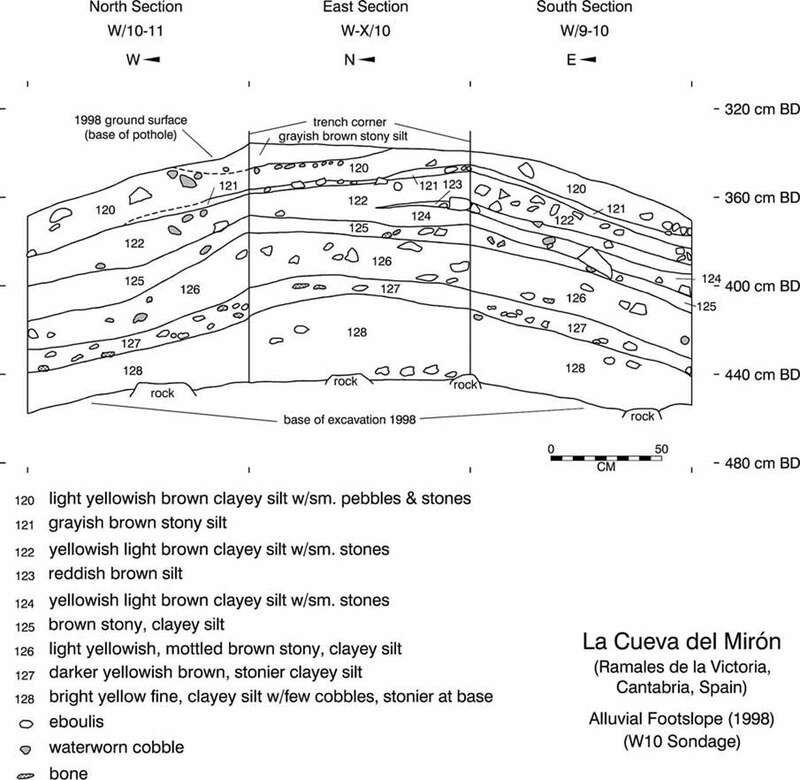 Despite its small size and peripheral location, the W-X/10 sondage at the foot of the eroded ramp-face of the ancient alluvial-colluvial deposit in the passage between the vestibule and inner cave of El Mirón, revealed the existence of repeated, but limited and ephemeral human visits during the Last Glacial Maximum, corresponding to the Solutrean cultural period. 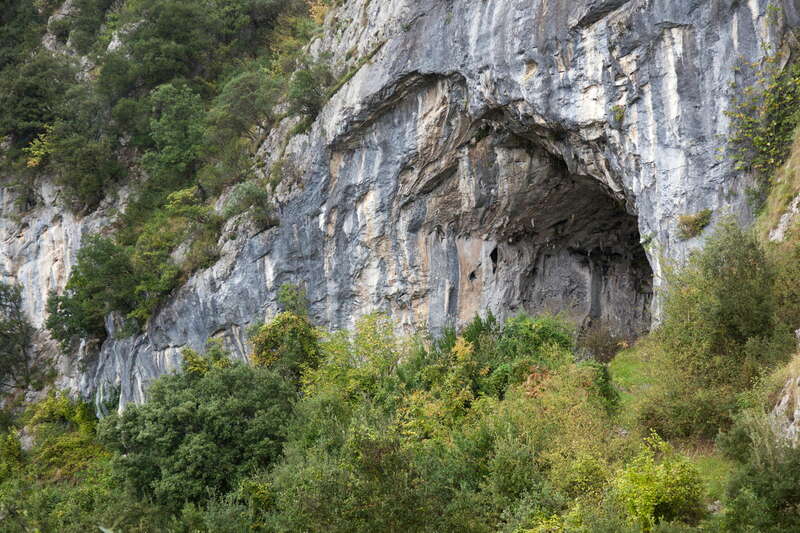 Solutrean visits to this cave in the montane interior of the Asón River Valley in eastern Cantabria seem to be confirmed by sondages in the front and middle sectors of the vestibule, although less clearly. 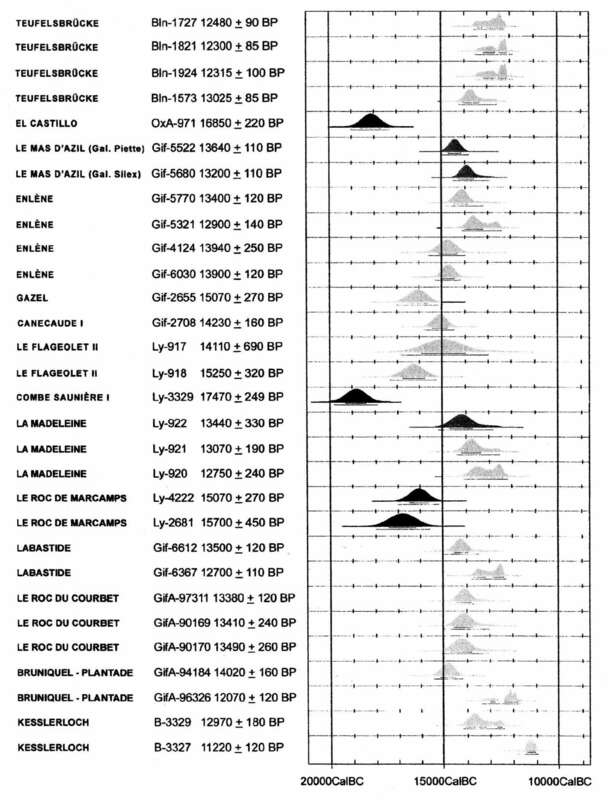 The artifact assemblages from W-X/10 suggest that the site was used for hunting (and fishing) expeditions, especially because of the relative abundance and (morphological and raw material) diversity of (mostly fragmented) Solutrean points. 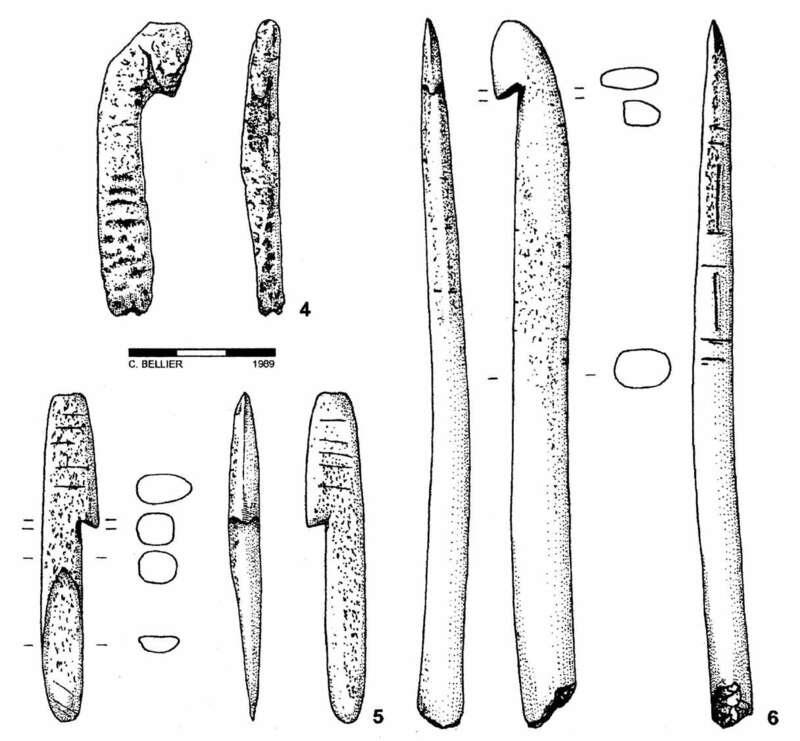 However, these ibex and red deer-hunters, who may have come to El Mirón for very focused subsistence activities (indeed there are very few other retouched tools besides stone points, and the latter are accompanied by also broken antler sagaies), did leave behind numerous perforated shells and teeth (cached or perhaps buried with a hypothetical defunct comrade – as yet to be found). In this respect, one is reminded of the cluster of nine perforated and engraved red deer canines found in Upper Magdalenian Level 2b of El Rascaño Cave, a small, specialized ibex-hunting site in the adjacent valley of the Río Miera or of the mass of 18 contours découpés of chamois heads and one of a bison from the Middle Magdalenian site of Labastide in the Central French Pyrenees. From one end of the Pyreneo-Cantabrian mountain chain there were montane sites of Late Upper Paleolithic age (mostly Magdalenian), sometimes specialized in the hunting of ibex (e.g., Erralla, Bolinkoba, Rascaño, Collubil, Ermittia, Les Eglises), but in other cases combined with the hunting of reindeer or red deer (e.g., La Vache). El Mirón is rather different from several of the limited function montane site because of its great size, commodity and physical versatility. It was obviously capable of harboring large, multi-purpose, relatively long-term, residential occupations. And such were the occupations during the Initial, Lower and Middle Magdalenian (and, for that matter, during the Neolithic, Chalcolithic and Bronze Age). However, it was also perfectly suitable for shorter-term, more specialized, smaller-scale, more limited-function occupations. And such seems to have been what happened (repeatedly) during the Solutrean (as well as in the Upper Magdalenian and Azilian, and even more ephemerally in the Mesolithic and Middle Ages). 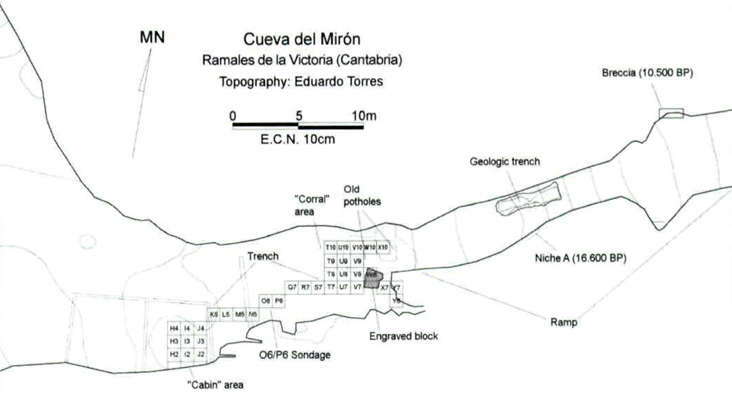 While El Mirón, despite its montane location, was clearly a 'hub' residential site during the early Magdalenian, like the great contemporaneous sites of Altamira and El Juyo in the lowland coastal zone, it was probably more appropriate only for Solutrean logistical use under the more severe climatic conditions of the LGM. One should not forget that, although the maximum extent of glaciation had occurred somewhat earlier, the Cordilleran summits and high valleys (e.g., Castro Valnera) continued to be significantly glaciated during Solutrean times, and the deglaciation occurred in sawtooth fashion during the Tardiglacial (i.e., Magdalenian). El Mirón, despite the relatively limited nature of its Solutrean occupations , seems to have been the most important locus in a small cluster of Solutrean sites above the confluence of the Ríos Calera and Gándara with the Asón at Ramales. This cluster would have had even greater significance if indeed the nearby red dot outline cave art sites of Covalanas, La Haza, Pondra and Arco were to be definitely shown to be of Solutrean age, as has been argued many times in the past (including arguments based on the - sometimes unique or at least prominent - presence of Solutrean artifacts in several of the red dot outline sites, such as La Haza, La Pasiega, Salitre, and, recently, El Pendo).